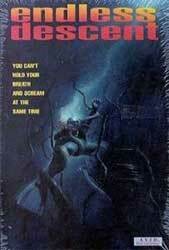 1989 saw the release of no less than four underwater science-fiction movies. All of them were severely flawed, and none of them, not even James Cameron’s ‘The Abyss’ (1989), were exactly hits with audiences. ‘The Rift’ didn’t come out until the summer of 1990, but without a doubt it began filming during this watery craze. Like its brethren, it has its share of problems. but also quite a few enjoyable moments. I feel there is yet to be a definitive science-fiction film set under the ocean. For some reason this particular sub-genre seems to fall short more often than others (‘Sphere’ (1998), I’m looking at you). Until then it’s a place to enjoy some b-movie thrills in a dangerous environment. Wick Hayes (Jack Scalia) is rudely awakened by some men in suits and dragged to meeting about an experimental submarine he designed: The Siren I. It has vanished during a secret mission and NATO has built the Siren II, to go find it. It’s operated by a multinational crew, including nerdy technician Robbins (Ray Wise), and the tough talking Captain Phillips (R. Lee Ermey). They locate a signal from the Siren’s black box in a deep ravine. The ravine is not only full of weird seaweed that shouldn’t be growing at such a depth, it’s also full of monsters. Despite all of this, the Siren II presses on to uncover the fate of the Siren I and the secrets that await them in an underwater cave. Probably the biggest flaw in the film is the fact that the plot is more or less wholly lifted from ‘Aliens’ (1986), right down to a betrayal from a crew member and a battle with a mother monster. Since you’ll probably know every dramatic beat, there isn't much in the way of tension or surprise. For an ocean based movie, there's little underwater photography. What does exist is obviously shot in a small tank and lacks the shear menace of size that a large underwater set, clever matte work, or actual footage on the ocean floor can achieve. There is a fair amount of miniature work, and it’s here the film tries to inject some scope with shots of the sub navigating the ravine and a massive blob monster that assaults the Siren II, but is sadly never seen again. The monsters are interesting, there are a variety of them and they appear like flamboyantly mutated versions of sea life. They are mainly relegated to the shadows, but make an impression none the less. The movie is also more than happy to splatter everyone and everything with copious amounts of blood and slime. Ray Wise and R. Lee Emery are of course the stand outs of the film, their ability to inject nuance into even the most clichéd of characters helps make the time between monster attacks all the more bearable. This is a double edged sword however, since both skilled actors also tend to highlight just how mediocre (or even downright terrible) the rest of the cast can be. The film smartly keeps those two around as long as possible. *It’s also helps that its 89 minutes shorter than ‘The Abyss’. Hey, I like The Abyss! I even went to see the Director's Cut in the theater. Admittedly it was way too long and overexplored much in the same way as the full cut of Aliens, but there was some good stuff in there. Not sentry guns good, but good.